Today I played photographer and, with the aid of a sheet of lining paper and a small table, took photos of my stash and current projects to add to this site and to Ravelry. They look really good and I am very pleased with the results. 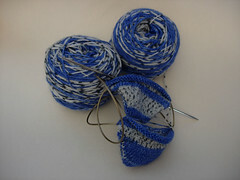 It really does make such a difference to my Ravelry page to have the visuals sorted. 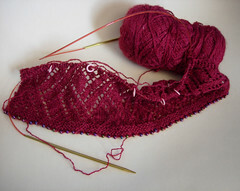 My two current projects are Hanami, which I have not got very far with but which I think looks really good in the Fiddlesticks wool-silk I chose. And another pair of socks that I am knitted in Opal sock yarn. Please note the method – both at once by magic loop! No SSS [Second Sock Syndrome] for me. I also have some cotton coming for another project and need to find a nice soft aran so I can knit Mrs Darcy’s Cardigan. It’s good to have things in the pipeline. see i have been putting off making a light box, because seriously, where am i going to put it so that it won’t be in the way, and i can see now, that i’m just faffing about, and than your way would work just as well.